Usually authors of PDF files apply password security on their PDF documents to disable unwanted users from doing any modification in the PDF file. In other words these PDF files cannot be edited, printed, and copied without entering a valid password due to applied restrictions. And that's where our PDF Security Removal Software comes into picture. This tool will enable you to remove PDF security in just few mouse clicks which would hardly take seconds. This PDF security removal software can remove PDF security from a password protected PDF file in no time. PDF Security Removal Software is an efficient as well as affordable solution to remove PDF security in no time and enables a user to print, copy, or modify the contents of a PDF file again. PDF Security Removal Software is an easy to use tool to remove PDF security that comes with graphical instructions and user friendly interface. 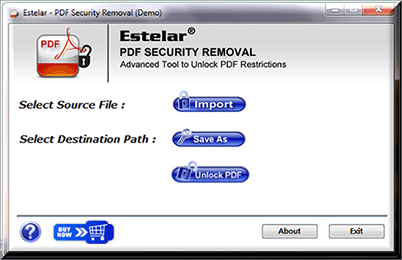 This tool will enable you to remove PDF security that too in just few clicks of your mouse.